Enjoy food that puts quality and flavour first. 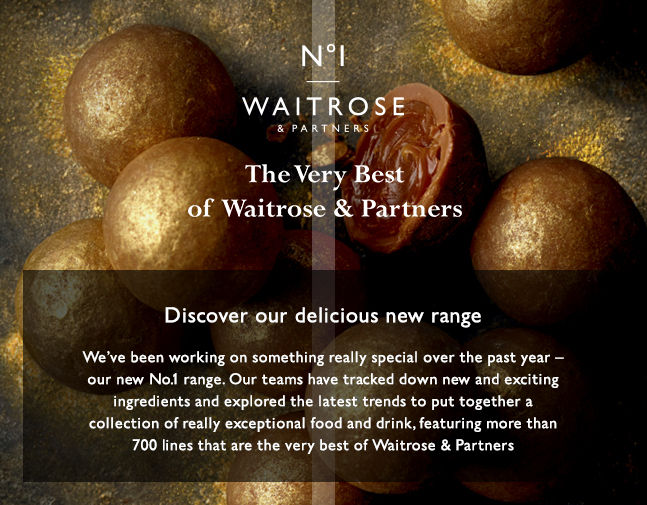 Our Waitrose 1 range has plenty to savour, including family classics, indulgent treats and not forgetting your top-rated products. Explore your favourites now. Bright summer evenings are best served with crisp salad and pizza straight from the oven. with Waitrose 1 Seasonal Leaves on the side. Why not grab a few pizzas to share with friends or family this evening? treats in the full range to enjoy, including Limoncello & Raspberry Mousses, Raspberry, Pistacho & Rose Tart, and Tanzanian Chocolate Ice Cream With Blood Orange Sorbet. That last one's quite a mouthful – and oh so worth it! puttanesca bean salad – it's ready in 15 minutes.